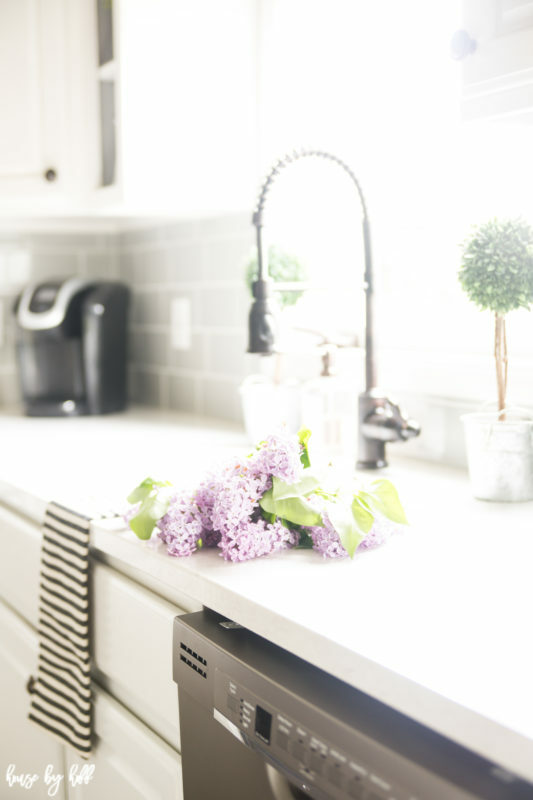 I’m back today with my summer kitchen! 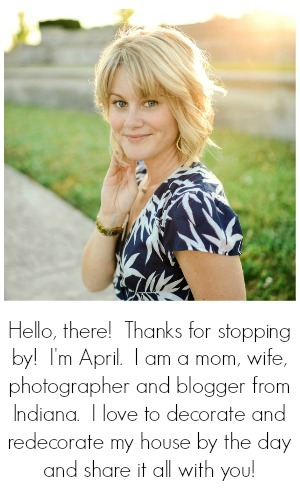 I’m so excited to be joining Jennifer from Town & Country Living. Jennifer asked us to include a punch of color for our summer home tour, which was a challenge I gladly accepted. 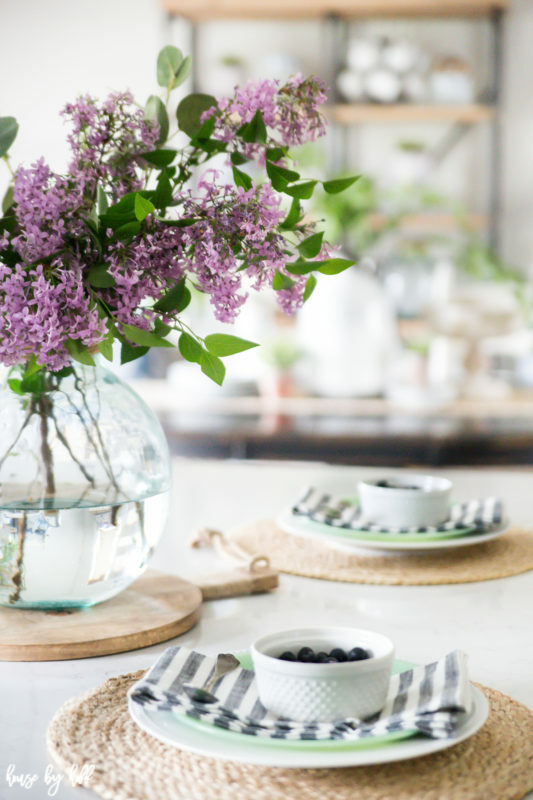 I chose to focus on purple lilacs that bloom in late spring/early summer, green jadeite dishes, and the blues that I always incorporate no matter the season. 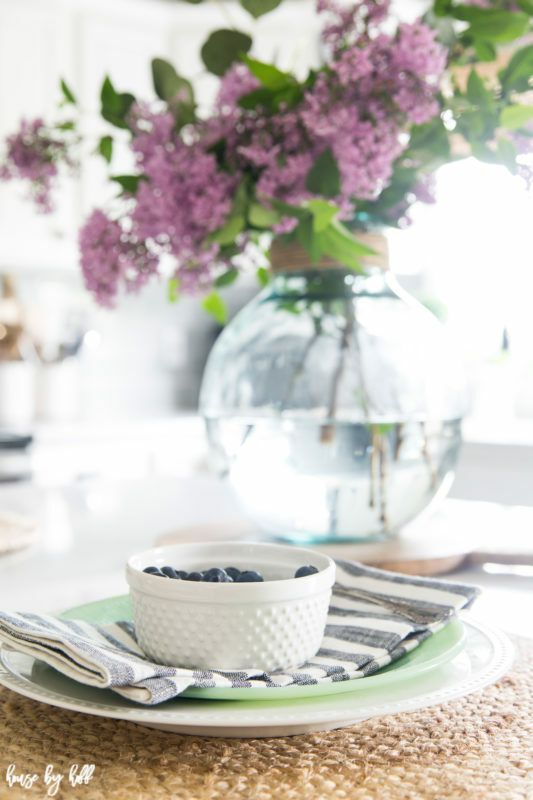 To me these colors set the scene for a home ready for summer! We have two more days until school is over! I have zero childcare lined up for Miss L., and I’m trying to figure out how we’re going to fill the days, and how I’m going to get anything done….the struggle is real! Luckily, we have some new kid neighbors down the road that she loves to play with, so that definitely helps! Speaking of being a works in progress, how about the summer kitchen? My kitchen has come a long way in the last few years. 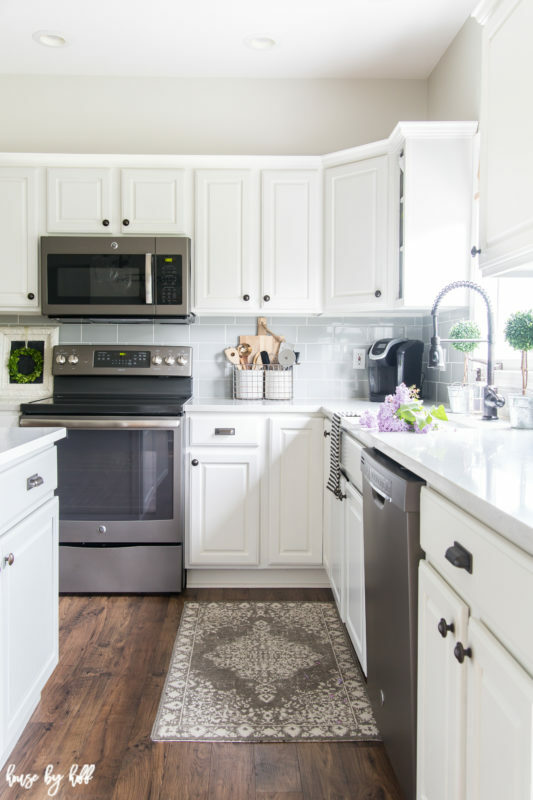 You can see all the details on our kitchen makeover here. 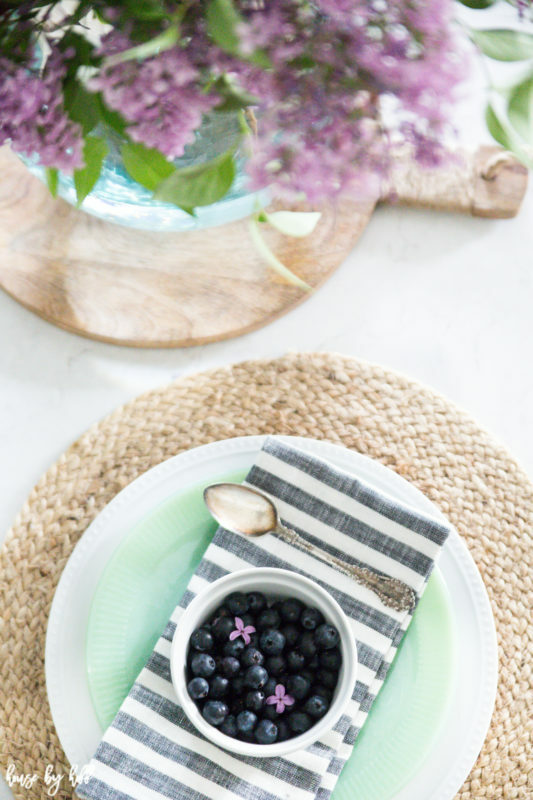 It was so fun to style my kitchen with some color for summer. 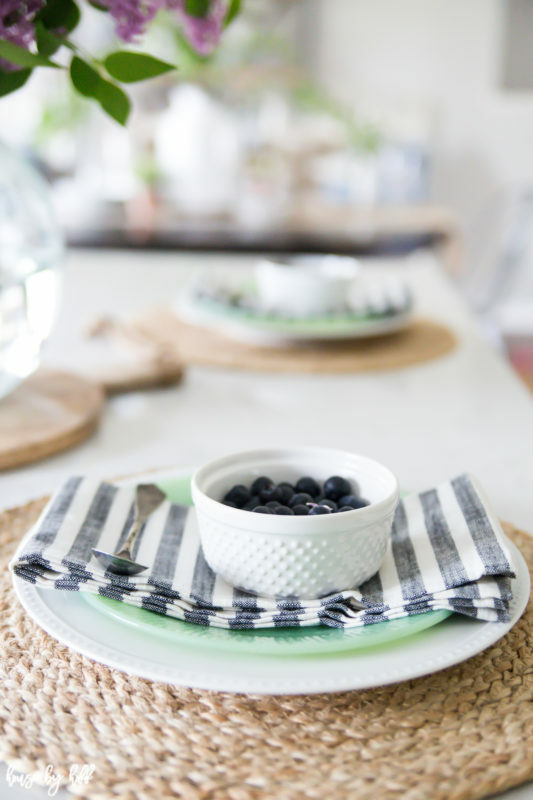 I pulled out some of my vintage jadeite plates and layered them with some fun striped napkins. As I mentioned above, I chose to incorporate some purple lilacs, trimmed from my sister-in-laws backyard. I love how the purples and greens play together. The shot above is my favorite picture I’ve taken in awhile. 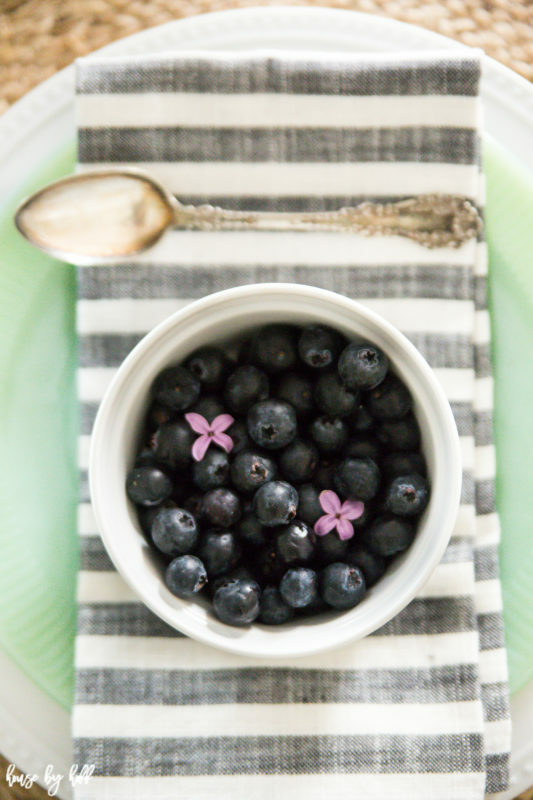 I love the simplicity of the berries in a dish with a few lilacs on top. It’s fun to bring some color into the kitchen. 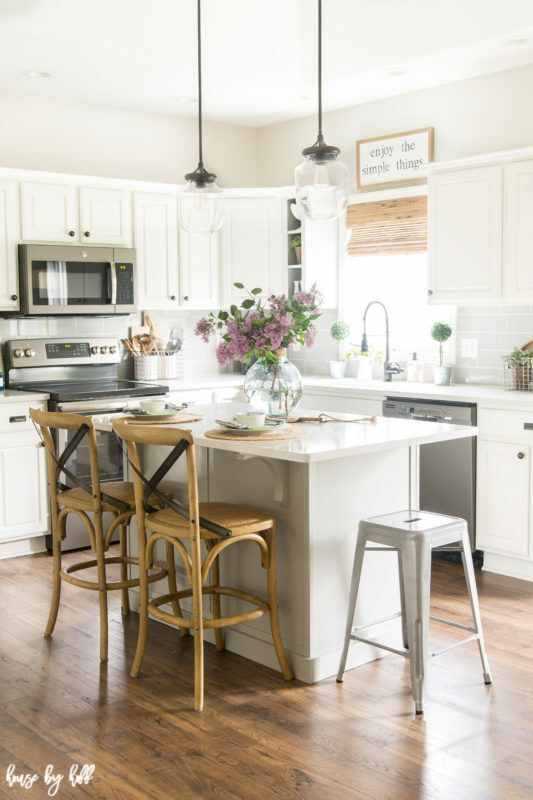 I purposely chose very neutral and cool colors when I chose the finishes for this kitchen. It makes it so easy to switch out colorful accessories against the neutral backdrop of grays and whites. Thank you so much for stopping by today! 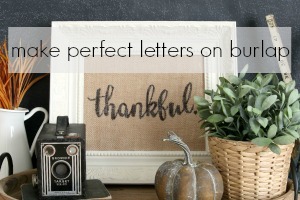 I hope you’re leaving a little more inspired and ready to decorate for summer! Please find my home sources below. *Affiliate links are used. Be sure to check out the whole line-up of the Summer Color Series this week! 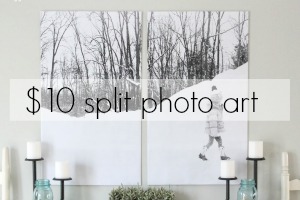 So much gorgeous inspiration! So pretty. I love the lilacs. Beautiful! So many lovely lilacs! Oh how I wish we could grow them down here. I miss their amazing scent! 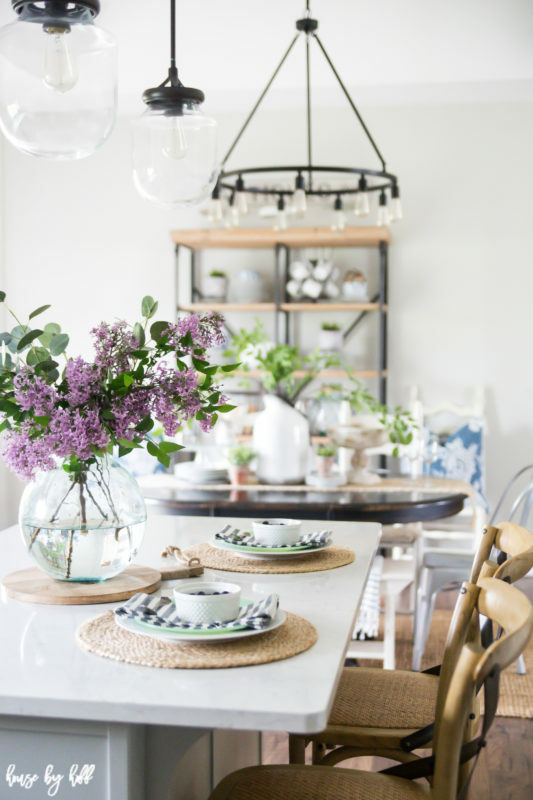 April, your kitchen is beautiful!! 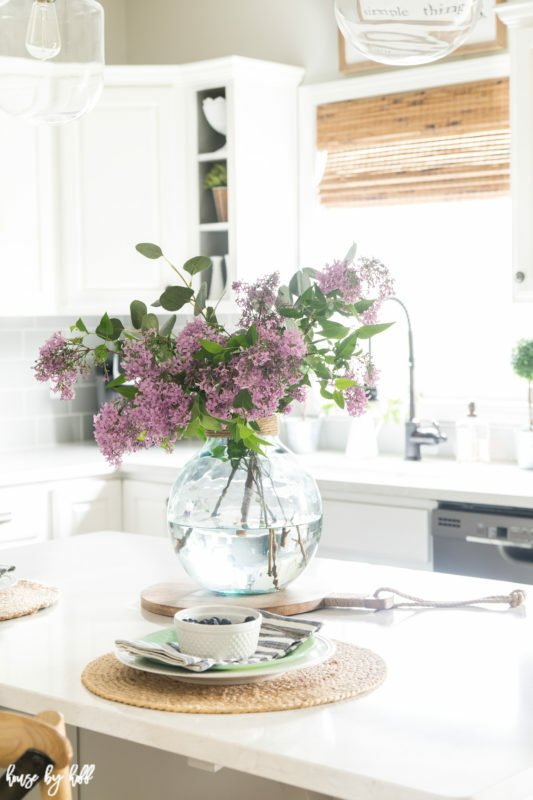 The lilacs are the perfect touch. I’ve always loved that shade of purple with the shade of green in your Jadite dishes. So so pretty!! Thanks for joining this week’s tour!